Last Friday, China announced plans to become the world’s largest producer of electric cars. The Chinese government will invest $1.46 billion in consumer subsidies for electric cars, just as Washington is plowing $25 billion into flagging Detroit automakers. With doubts looming about China’s enthusiasm for the tough upcoming Copenhagen climate negotiations, and with China set to displace the United States as the country with the largest auto fleet by 2025, this commitment to electric cars has vast implications for climate change, energy, and global geopolitics. China is already the third-largest car producer and the second-largest car market in the world. If China could electrify its entire auto fleet by 2020, it could cut annual oil consumption by 130 million tons, reducing dependence on foreign oil by 20-30 percent more than if it were to adopt high-efficiency combustion vehicles. This would go a long way toward easing global competition for oil. It would also effectively eliminate the number-one source of air pollution in major Chinese cities, relieving a huge environmental health burden. 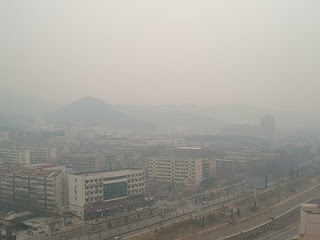 Reports indicate that residents of at least 400 Chinese cities will face significant health hazards—including brain damage, respiratory problems and infections, lung cancer, and emphysema—from airborne sulfur by 2010 if auto pollution is not brought under control. As these subsidies and other policies (including next year’s nation-wide adoption of EURO IV emissions standards) demonstrate, the Chinese government is committed to reducing cars’ impact in China, and the country is poised to be a global leader in electric cars. China’s battery-company-turned-automaker BYD (which Warren Buffet is apparently investing in) will release the first zero-emission vehicle, the F3e, in late 2009. The plug-in, dual-fuel F3 was the top-selling car in China last year, selling for $22,000. In a report released last month, McKinsey & Company found electric vehicles the best option for reducing greenhouse gas emissions from China’s transportation sector. China’s low labor costs, fast-growing auto market, and successful battery manufacturers make it a candidate for world leadership in electric-vehicle production, especially as no clear leader already exists. The greatest obstacles to electric vehicles taking off in China are the costs—both to the government and the consumer—and the current lack of support infrastructure, including battery-charging and replacement stations. Installing support infrastructure could cost 5–10 billion RMB by 2020, not to mention the costs of further research and development to improve the safety and speed of batteries and cars, as well as the cost of consumer subsidies. Further research on the health and environmental impacts of electric vehicles is needed before large-scale adoption. There are many concerns, for example, about how to safely recycle car batteries without causing lead pollution. Additionally, having cars run on electricity will reduce air pollution, but will also place a huge burden on China’s already-strained power sector, which experiences energy shortfalls every year. Making the entire vehicle fleet dependent on the power sector would require a major expansion of regulatory and generating capacity. It could also raise questions of environmental justice, as rural communities with little access to health care—but in close proximity to coal-fired power plants, from which China derives 80 percent of its electricity—would bear the pollution burden of city driving. Although most experts and officials agree that electrifying China’s vehicle fleet is the best option in terms of environmental health, energy security, and climate change, additional research into the cumulative impacts of electric vehicles is necessary. Photo: Smog blankets the eastern Chinese city of Jinan. Courtesy of Flickr user Sam_BB. By China Environment Forum Program Assistant Linden Ellis. What effect will China’s new emphasis on electric cars have on its dependency on coal power? Will the rate at which they build new coal power plants increase causing more pollution? As a follow on thought, China is producing coal power plants at a rate of one a week and has no signs of slowing this pace. The greed fueled by China’s hunger for coal has a high cost in human life and at the same time is hurting the health of the entire planet. I believe that the Chinese government should focus on emission standards on vehicle production and not on electric car production. The Chinese government, a Communist regime, has the ability to make overall sweeping changes. Despite this ability they are slow to make changes to emission standards in new car production. The $1.26 billion in subsidies for electric car consumers will do little if anything to solve the environmental problems that China is facing today. Nothing but radical changes can have any effect on a population the size of China. China has a lot of coal, just like the United States and it is cheap. They also have an overriding emphasis on keeping the economic growth rate at 8-10%. Given the level of poverty that continues to in particularly rural areas of China, it is not necessarily irrational or “greed” that would explain the bringing so many more coal fired power plants online. That said, the climate discussions are starting to have talk of Chinese willingness to agree to some sort of targets. And finally, I think the vehicle emission standards in China, particularly for trucks, is actually significantly higher than in the US.